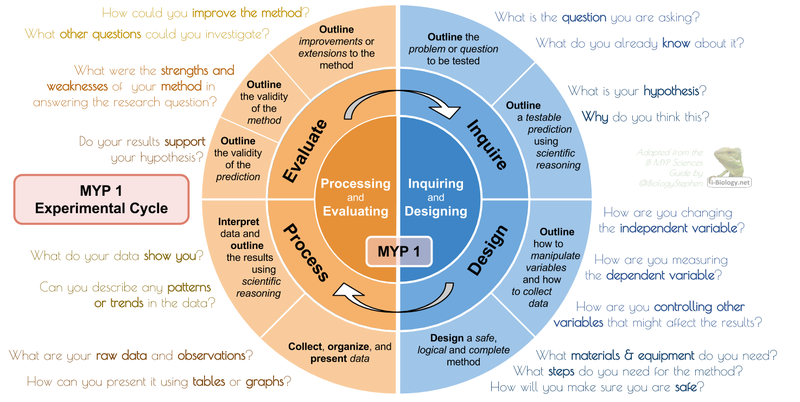 This graphic of the Experimental Cycle is adapted from the IB’s MYP Sciences Guide assessment descriptors (2014), using GoogleDrawings. 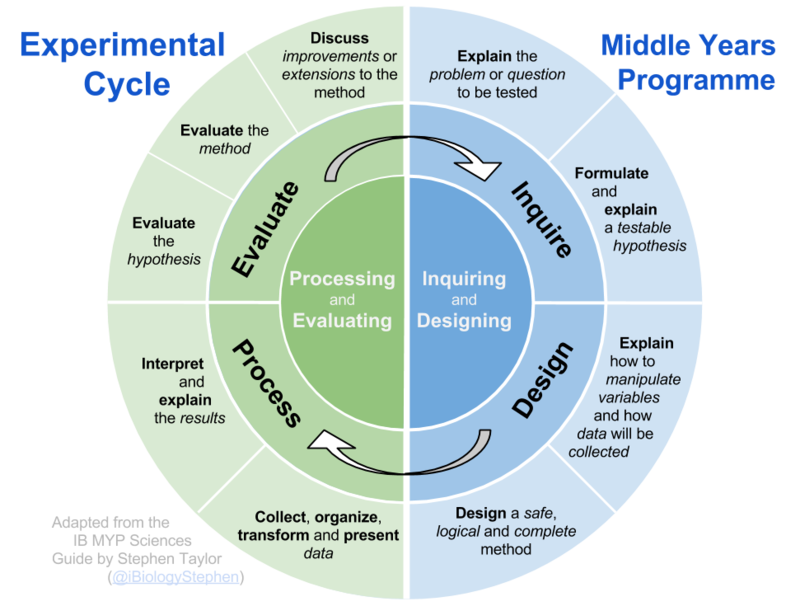 The experimental cycle is a visual representation of the process of a lab inquiry – and also of the stages of a lab report for the ‘Inquiring and Designing’ and ‘Processing and Evaluating’ assessment criteria. It can help structure a lab, but make sure you get hands-on! Other file types: svg file, GoogleDrawings file. These were created to give a linguistic support to inquiry in science. For EAL learners, they provide vocabulary and a starting point. For all learners they are a way into the language of science. We used them as printed inserts in physical student lab-books, and found best gains in keeping the students off laptops for as long as possible, holding them to full-sentence response in speech and writing. We have to act (or speak, write) our way into a new form of thinking. I don’t advocate for these being used alone and forever, though. Once students are confident in them, they will want to use their own formats or phrases. We had students who were ready for more sophisticated language after one or two cycles, and others that needed support for longer. These cycles and stems are intended for “get going quickly and let go quick” learning and support. Having a printed structure like this should increase student inquiry and thinking, not decrease it. Knowledge is the stuff we think with: fluency in the foundations is a jumping-off point for us to support student thinking. This is a differentiation tool. It should not be boiled down to a form-filling formula. Here is a GoogleDoc version, with sentence stems for MYP 1 Students, to be used to help guide their language. Click File –> make a copy to make and edit your own. Please, if you use these with students, try to emphasise the importance of “play” in science. It is entirely possible to spend a long time writing a lab report to meet the requirements (on paper), only for the method be unworkable. Are we inquiring through science… or “doing lab reports”? In the early stages of lab design we can take more of a design-cycle approach: get hands-on with the equipment, try to actually manipulate the IV and see if the idea can even work before committing it to computer-work (or worse, homework). Consider thinking about the structure and sequence of your course. Physical sciences lend themselves to quicker investigations than Biology and so might suit the start of the year, for example. What can we do to get students hands-on, minds-on as soon as possible, to manipulate variables and see the cycle at work? In the early stages of a lab, I keep students off the computer for planning. They might use it for research, but I much prefer that they don’t start “writing the report” before the data are collected. Students will show me their method outline, table ready for data and safety considerations before they collect the data. Once their data are recorded, we look at them together, scanning for anomalies or problems before setting off on the spreadsheet and then the write-up. The Design and Arts Cycles are adapted from existing graphics in MYP Subject Guides. The remainder are self-created. Americanized spellings: svg file, GoogleDrawings file. 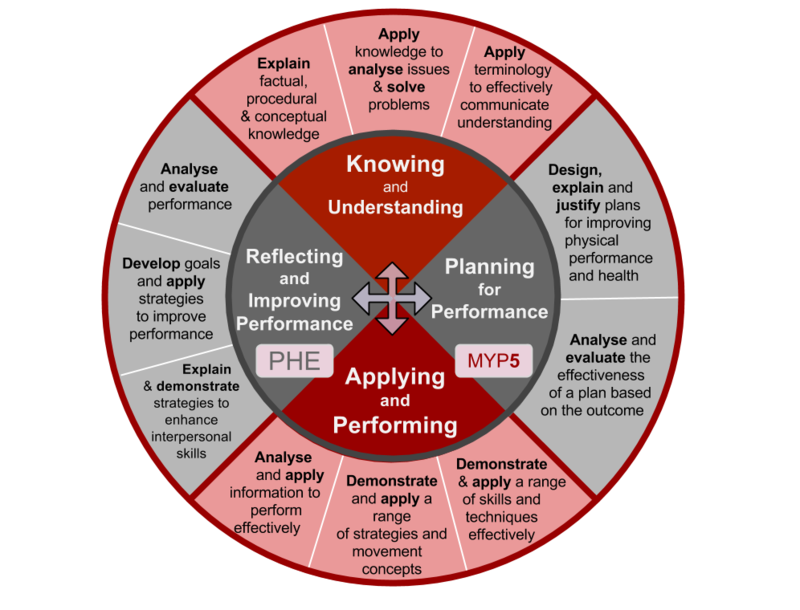 PHE Objectives (MYP5) in CA Colours. Go Falcons! For the IB Diploma: IBDP Investigation Cycle. A cycle diagram has not been produced by the IB for the DP Sciences, so here is my attempt. Click for a Google Drawings copy. If you find these resources (or any posted to i-Biology.net) useful, pleas consider making a charity donation through my Biology4Good project. These are fabulous. I wasn’t able to edit any cycles. I would like to be able to edit the Science cycle to integrate the Design Cycle with it. (Our sciences integrated the design cycle in many units.) It would be nice to have one graphic with both on it. Is that possible? Hi Cheryl – if you make a copy into your own Drive you will be able to edit them. Good luck! Thank you! You have saved me a lot of work, was just looking for something like this! Hi Stephen – I did something similar for the PP some years ago – it needs to be updated as it is based on Old chapter … will tweet it through to you. Great work on these visual representations.. I love your cycle visuals. With your permission, I’d love to use them with my teachers. The Diagrams you have worked up here are fantastic. I really would like to make use of them in my teaching & research but I am having a difficult time ascertaining how to properly cite you. Is this blog the only place you have published this or have you gotten it into a journal and I am just missing that link? Again, well done. Hi Joshua – thanks for the comment. Please attribute using my Twitter handle (@sjtylr) and this link, or the one on personal site.